Here is an article, written by Shivashankar, the youngest to crack one of the most coveted All India Service – Indian Forest Service just at the age of 22 in his 1st attempt. His story is an inspiration to all the young college pass-outs and a strong motivation to the senior aspirants to what Belief, Dedication and Honesty can do to achieve one’s dreams. As we have time and again said, ‘IASbaba is not an entity.. it’s a Vision shared by many like-minded individuals’. We are very happy and proud to say that Shivashankar is one among us. He is one of the key resource of IASbaba ! One reason which has given me an opportunity to write this article is my personality test of Indian forest service 2015.One question which changed the course of my interview was “tell me some problems encountered by forests in India”. My answer was “ Sir, I have not seen any forests as I did not get any opportunity to visit one, so I cannot explain you the practical problems encountered by Indian forests”. Following my answer the member put across another question “ Then why do you want to join Indian Forest Service?”. My reply was “ I’m from a lower middle class family, It’s very hard for me to see my father toiling all day in a workshop, I want to make sure I have a respected job and help my parents lead a stress less happy life”. I think this was the answer which fetched me a score of 210/300, second highest score in this years forest service personality test(highest being 213/300). Take my case , two interviews, one in may 2015 and another in January 2016. In my civil service interview I got only 135/275 , however in forest service I got 210/300. One important thing to note is, for both of my interviews I got the same board, Smt. Alka Sirohi madam. In less than 8 months time how can one’s personality change? How did I increase my score by such a big margin? One reason I can think of was my confidence and being honest in the interview. Generally if candidates are asked why forest service/civil service? Their reply would be : I want to serve the country or its my childhood dream or its my passion. However I was honest and confident enough to tell the reality as to why I wanted to be an IFS officer. From my childhood I had only one aim, I want to be a youngest IAS officer i.e an IAS officer at the age of 21. When I was in my second year of engineering i.e at the age of 19 I started preparing for civil service (exact date of start is 17th December 2012). I passed out of engineering in 2014(at the age of 21), gave my first attempt in 2014, cleared prelims, mains and went to interview. Because of a very low score of 135 in interview I missed out the final list in 2015 by only 2 marks. My dream of becoming an IAS officer at the age of 21 was shattered. However I gave my second attempt,(first attempt in forest service) this time focusing more on forest service, I cleared it and have become an IFS officer at the age of 22. My guide was internet (courtesy- IASbaba, which played a pivotal role). More than 90% of my preparation was from the internet. Always I had mains syllabus with me which I used to refer very often. Two most important questions while preparing for civil service is What to study? And How to study? My answer was what to study is syllabus, as there is a detailed list of topics given. How to study was to refer previous years question papers as you get to know how exactly questions come each topic. Key for prelims is knowledge and practice. You have to be well versed with all topics with high accuracy in answering questions. I had solved more than 50 full length practice question papers of almost all institutes before I could give my first prelims. For mains key is to know something about everything and practice answer writing as much as possible. Even though I had a very good score in mains I failed to be in the final list by a mere 2 marks as I got only 135 marks in my personality test. I tried to use my civil service knowledge in forest service exam. In General English paper especially report writing and essay, my civil service knowledge helped me a lot. Practice is the key in this paper. Practice more of essay, report and letter writing and most importantly precise writing. One important thing to note, optionals are the key to clear IFS exam. Among two optionals, one should be considered as primary and the other one as secondary. Primary optional should be given more importance and try to score atleast 200/400 marks. In secondary optional any score between 120 -150/ 400 would suffice. My primary optional was forestry and secondary was geology. Indian forestry by Manikandan and Prabhu, which is widely available. Geology: Text of geology by PK Mukherjee and geology by KM Bangar. These two books cover majority of the syllabus. For topics which are not covered one can refer internet and make some notes which can come handy while revising at the last moment. I was done with my complete forestry optional and half of geology before prelims. 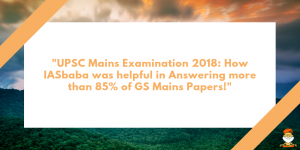 After prelims result I tried answering previous years question papers of forestry and geology in exam like conditions and also I tried to solve last 5 years question papers by making short synopsis of each question for both the optional’s and revise the same as many times as possible. Study all necessary things required for the exam, practice more prelims question papers as competition is increasing day by day along with toughness. Write as many answers as possible for general studies mains. Take regular breaks in between your study time and relax and refresh. Never lose hope as there is always a strong element of luck involved in the exam process. Lastly listen to all strategies, but design and pen down one strategy that suits you as per your strengths and weakness and follow it until you reach your goal. In September 2015, I got in touch with IASbaba Team. Along with my preparation for exam, I started to write daily current affairs articles regularly for IASbaba. As this time I did not take up any mains test series, writing articles helped me a lot, as I improved my presentation and structuring, which matters the most in mains exam. I also followed TLP mains programme both for GS (100 day plan) & Geography, which helped me very much in writing answers for forestry and geology papers. The interview preparation at Iasbaba is unparalleled, for the team is of people who have actually been to interview and also cracked it. We thank Shivashankar for sharing his experience and hearty congratulations once again. Going forward, Shivashankar will be playing a greater role in IASbaba.